Being a trained electrician, I found myself in 1990 in front of a CAD workstation to develop a switch and control station. Obviously, I got infected by a then unknown 'virus', and that's just fine. Abstract: Linux server are performing their job reliably and safe, they don't need any special attention, they run and run and run... But what happens if the little penguin is getting too hot? The past summer did show us: we should give to our little friend a temperature monitoring system. This article will show you how to install one with little effort for about 10 Euros. 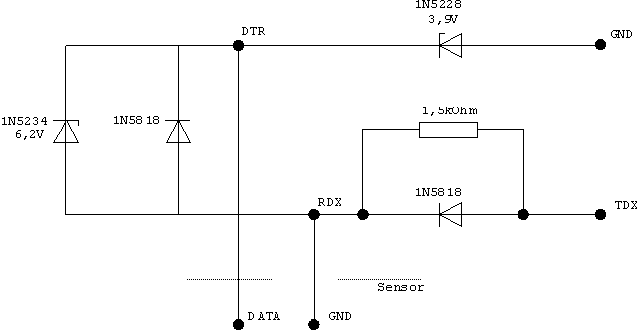 Brian C.Lane has written a program for the temperature sensor DS1820 from DALLAS Semiconductor It is not hard to assemble a temperature monitoring system with these two components and a handful of other parts. Those of you who want to use his current versiondigitemp-3.2.0.tar.gz can download it from http://www.digitemp.com/software.shtml . The sensor was originally produced by DALLAS Semiconductor which has merged to Maxim/Dallas Semiconductor. According to the data specification the sensor can measure temperatures from -55°C to 125°C. The measurement data are generated as a digital signal with a width of 9 bits. In addition each sensor owns a 64 bit I.D. number, allowing to interface (bus) a number of sensors. It is possible to utilize 100 sensors on a bus of a length of 300m . The circuit we are presenting here shall work with only 10 sensors on a bus of 60m. I am using at present 4 sensors on a bus of about 12m. You can find more information about the sensor in this Spec Sheet. I want to add that the circuit presented here can measure only up to 75°C, which should be adequate for our application. To be able to connect the sensor to the serial interface we need additional components. You will find them at most of the retailers of electronic parts, in the internet or -even better- in the electronics store around the corner. Since the interface circuit is very simple I choose to assemble it on a breadboard. Sorry for my soldering artwork :-). With some skills the components can be installed in the plug of the serial interface. On this page of LinuxNetMag we can find an article on digitemp, also a forum describing a circuit for measurements above 75°C. I have not yet testet that circuit. For our interface circuit only two contacts of the sensor are required, the connector VDD can be removed. I simply snipped it off :-). Here is a table of the circuit of the interface card, the sensors and the serial interface. In the newly installed directory digitemp1-3 we find the source code, documentation and some Perl scripts, but also the binaries digitemp, which can be used as they are. If digitemp is invoked without parameters we will get an overview of the parameters presented. into a spreadsheet or other graphing software. digitemp - %s for sensor #, %C for centigrage, %F for fahrenheight. As 'Help' tells us the installed sensors need to be initialized. For this we need to define the interface to which our circuit is connected, as well as the parameter for the initializing. accomplishes that, in this case the interface circuit is connected to the first serial interface. We notice that the software detected 2 sensors. In addition the file .digitemprc will be created in the current directory, it will contain the data of the sensors, the interface and the output format. With the command ./digitemp -a we are now able to read the output of the sensors. Please note the ./ character, we are still in a directory which is not part of the current search path. To integrate our program into our system we need to do a few adjustments. First, we need to copy the binaries, e.g. digitemp, in a directory which allows the execution of programs without path definition. I selected/usr/local/bin/ for this. Those who are not sure about this can find the paths with echo $PATH . Furthermore, the file .digitemprc with the initializing data needs to copied to the home directory of user who carries out the measurements. To save the data in a file and not on the console the switch -l[PATH/FILE NAME] needs to be applied. initiates digitemp to execute a measurement every 15 minutes and to write them to/var/log/digitemp.log . With the command tail /var/log/digitemp.log we can read the last lines of the measurements. If the file /var/log/digitemp.log is not being generated, please have a look at the file access rights. The archive contains a few Perl scripts for the graphical interpretation. I am not going to describe them here. I am pondering the idea to write another article on how to collect sensor data in the data base mySQL and how to interpret them through a web interface. This will mainly be done with Perl by using the function mySQL, CGI, graphic.